Working at the fence only when you dog is calm. In my last blog, I mentioned that changing your dogs behavior begins with good management which prevents him from practicing the unwanted behavior. I will now explain how to change your dog’s response when meeting a stranger, using the processes of counter-conditioning and desensitization. Counter-conditioning means changing the negative association the dog has formed about people, and replacing it with a positive, happy association using something the dog loves. Desensitization means exposing the dog to the “stimulus” (in this case, a person) at a distance, far enough away that it does not provoke a fear response from your dog, and gradually reducing the distance to the person until the dog is relaxed with the person nearby. Subsequent training can continue as your dog remains calm, and is able to accept treats or play with toys. 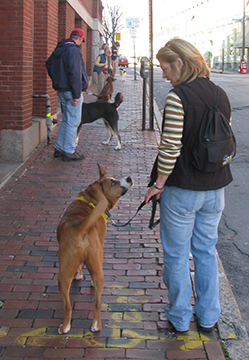 Repeat this process for several weeks in neutral environments, like your street, rewarding your dog when a stranger appears as long as your dog is in a thinking frame of mind and not barking and lunging. Over time, your dog sees a stranger and begins to feel less stressed and can offer a behavior like looking at you for something rewarding, like food or a game of tug. 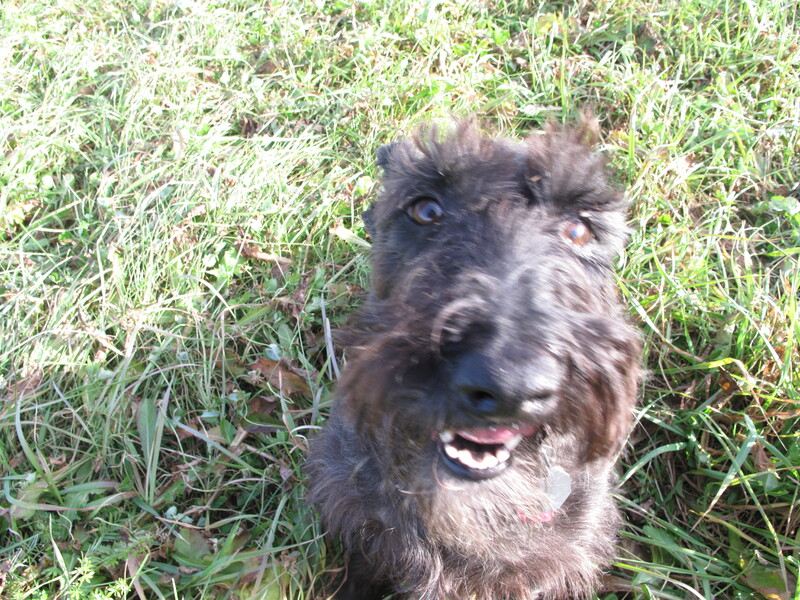 Changing your dogs emotional state will change his behavior. Friends who want to help you can participate in this desensitization process but should be coached to not approach your dog, but rather wait for the dog to approach them. Then they can toss a treat at his feet, then toss one farther away behind the dog to help the dog feel safer. The friend can continue to walk down the street while leaving a trail of treats behind them for the dog to enjoy. Hence, people = yummy food! I suggest you introduce new friends outside your home or down the street, as your dog needs to be calm for desensitization to work. If your dog is on a leash, be sure the leash is slack and the handler follows the dog, rather than directing the dog’s movements. This gives your dog a choice in how close he wants to be to the stranger which allows desensitization to be effective, and it allows you to constantly see how your dog is feeling. Pay attention to your dog: if they become stiff, intense, begin breathing fast, or barking, slow down as desensitization needs to happen to change your dogs behavior. 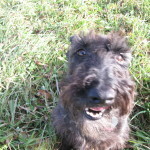 I rescued my scottie with a 5 bite history, she can now greet strangers in neutral environments with a relaxed happy state of mind. Avoid trying to “make your dog like guest right inside your front door” as this is often where your dog is barking and growling, therefore he is not calm enough to learn. Sure, he may gobble up the treats, but if he is still highly aroused such that you need to hold him tight, then he may be over threshold which slows your progress. 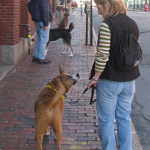 In Summary, to desensitize your dog to strangers effectively, you MUST start in a location where your dog is calm. 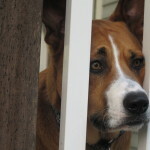 If your dog acts aggressively towards strangers at your front door, then start outside in the yard or on your street. 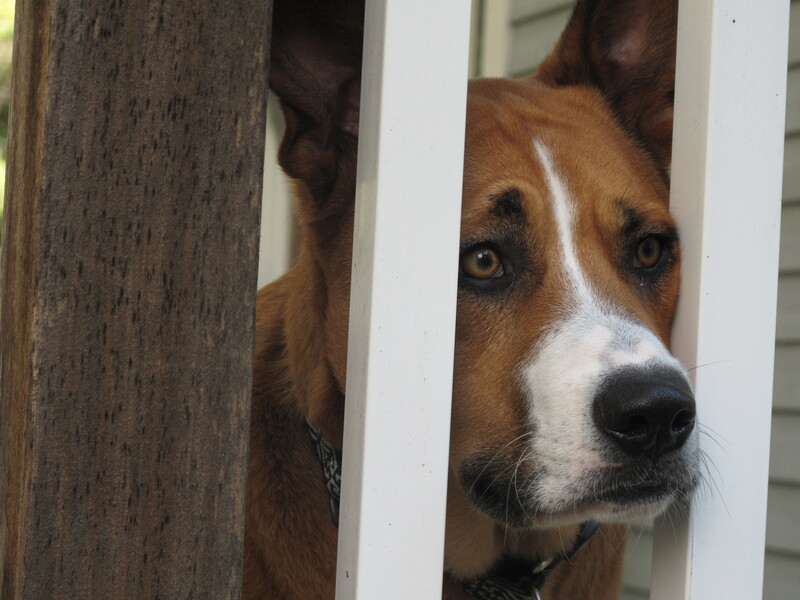 If your dog acts aggressively at the gate or fence, then you need to take your dog to a neutral environment down the street so he can be calm enough to think and learn. If a dog is acting aggressively when you approach his kennel, then start with him outside where he is calm and can think. 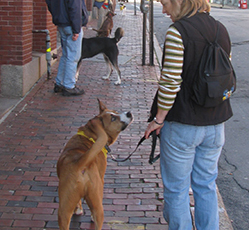 Many dog owners fail to change how their dogs feel about strangers because they start in locations that are over their dogs threshold so no learning can happen. This process of counter-conditioning and desensitization may take 6 week, or 6 years! It simply depends on your dog’s current associations. So be a good dog owner, and if you see your dog acting anxious or skittish around people, begin the process of counter-conditioning and desensitization so you can reduce your dogs stress when around strangers and therefore reduce a potential bite.